This cheat works great. You can use the skills for MISSIONS, DUELS and to LEVEL UP with the latest skills that you have not learned. But remember, the skills will disappear from your Jutsu if you refresh the game. So do not refresh the game or you will have to relearn the skills to use them. Go to Academy and select any Long-training time skills to learn. An 'Edit Response' tab will appear. Click it. You will immediately get the skill. You can continue learning more skills. Just repeat from Step 8 each time the game freeze. 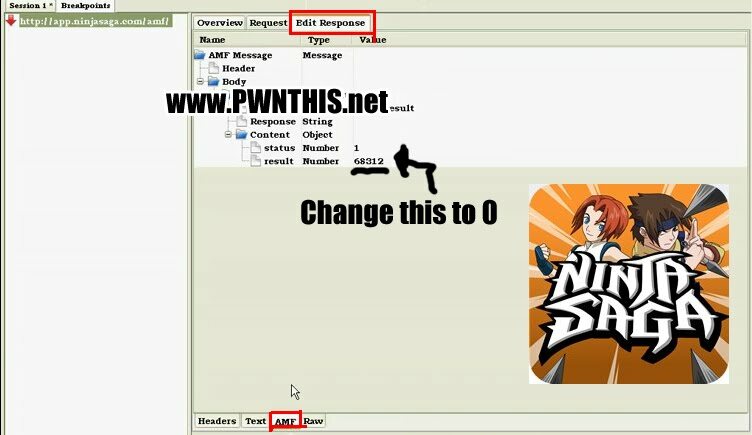 Important: Remember to go back to the Structure Tab, right click 'amf/' and select Breakpoints to continue playing Ninja Saga. Once breakpoint removed, go play your missions, duels with friends. Just note that skills will disappear if you refresh the game. But whatever experience/gold you earned is saved.